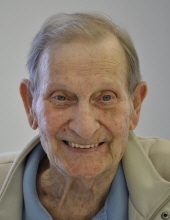 Roscoe Edmundson passed away peacefully at SECU Hospice House in Smithfield on Tuesday, October 23, 2018 with his family. The family will receive friends on Saturday, October 27, 2018 from 2:00 – 3:30 p.m. at Seymour Funeral Home followed by a service to celebrate Roscoe’s life and give witness to his faith in Jesus Christ at 3:30 p.m. in the chapel with Rev. Greg Stancil officiating. Interment at the Edmundson Family Cemetery in Pikeville will conclude the service. Roscoe was born in Wayne County on April 29, 1924 to the late Burrell and Bessie Edmundson. A veteran of World War II, he was a longtime member of Antioch Free Will Baptist Church and the first chief of the Antioch Volunteer Fire Department. Roscoe will be remembered for his generous spirit, zest for life, and devotion to his family and community. Roscoe is survived by daughters Marcia Edmundson and husband Christopher Wienert of Chapel Hill and Harriet Glotzer and husband Robert Glotzer of Garner; grandchildren Jason Dressel and wife Heather and Katherine Scott and husband Michael; and great-grandchildren Gavin Scott, Noah Scott, William Dressel, and Evelyn Clara Dressel. He is also survived by his sister Bertha Davis and brother Henry Edmundson. Roscoe was preceded in death by his wife of 69 years Clara Ginn Edmundson; his parents; sisters Mollie Kirby, Lawlos Bland, Atha Tunnell, Ruth Hokum, and LaDell Shackelford; and brothers James Edmundson and B.J. Edmundson. To send flowers or a remembrance gift to the family of Roscoe Edward Edmundson, please visit our Tribute Store. "Email Address" would like to share the life celebration of Roscoe Edward Edmundson. Click on the "link" to go to share a favorite memory or leave a condolence message for the family.